First, an apology for taking so long to get this documented, but we've been busy. Second, an apology for the length of this post. I thought about breaking it up between the two countries, but decided not to. It was all one trip, so it is all one post. You may want to get a cup of coffee before you begin, and check your bladder. 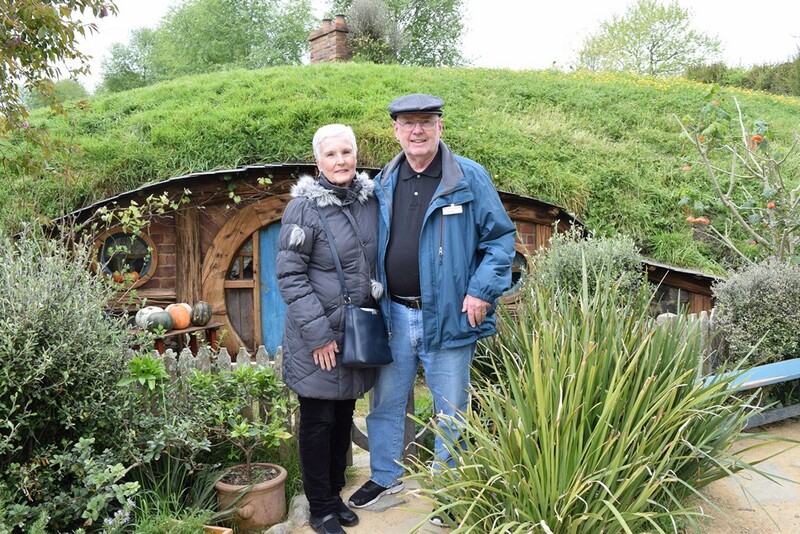 Visiting Australia and New Zealand had been on our bucket list for many years, and when we neared our 50th anniversary we decided that a trip like that would be a great way to celebrate. We made plans to travel in early October which would be early spring in the southern hemisphere, and after our six month stay at our summer hang out in the mountains of Northern Arizona. We were going to leave our trailer at the Blue Ridge Ranger Station where we spent the summer, and drive to CA to catch our flight to Australia. Unfortunately, plans were changed when Darin's house caught fire and burned in late August. Since we actually owned the house and Darin needed our support we moved to Tennessee and were set up in a campground in Benton, TN by September 4. 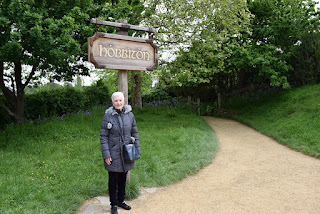 The next four weeks were filled with hectic activity which I will not detail here, but the change in location required a change in travel plans. 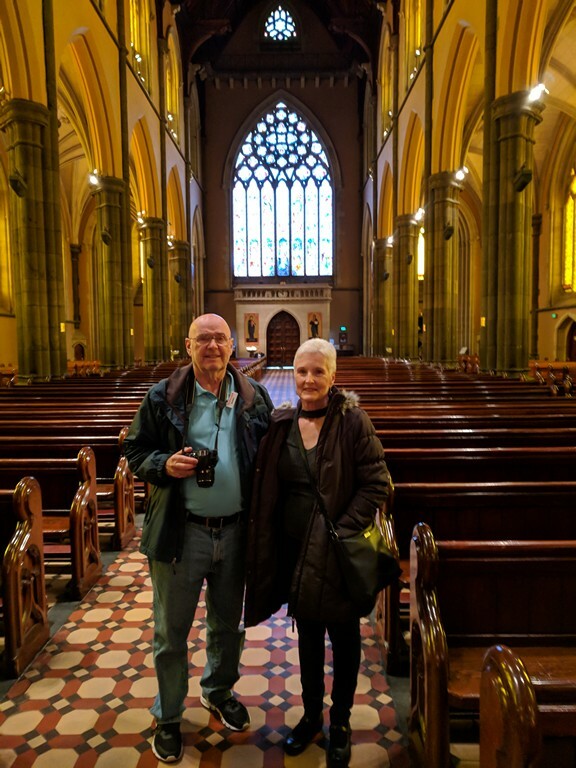 We made reservations to fly from Chattanooga to Atlanta to Los Angeles on the 2nd of October so we could catch our flight that evening at 11:30 PM for Melbourne. We left Chattanooga at about 3 in the afternoon and arrived at LAX about 10:45 local time, so we had already been traveling 10 hours by then. We walked next door to the international terminal and checked in for our flight, and the timing was just about perfect. The only fly in the ointment was that there must have been a lot of flights leaving that evening about the same time, because the terminal was a zoo. It makes sense because leaving about that time and flying overnight to the far east makes a lot of sense. We had decided to treat ourselves since this was a special occasion, and upgraded to Premium Economy on Quantas. The seats were not lay flat, but they were much larger than those in economy, and they reclined much more. There was even a way you could put your feet under the seat in front of you that made it quite comfortable. We were early in the day so well before check in time. Still, the desk had a room available for us. Unfortunately, we discovered that it had twin beds. Somehow our reservation from the tour company had us as requesting that. I said we had been sleeping in the same bed for almost 50 years and I was not about to stop now. They did have another room available with a king bed but it was a handicap room. In retrospect I wish we had waited for a standard room, but we really wanted to get settled and have an opportunity to get some rest before meeting the rest of our group that evening. We couldn't even open the door by hand. You had to push a button on the wall about 10 feet away from the door, and the shower and bathroom were definitely "handicap accessible". Nonetheless, the view of the Yarra River and some of Melbourne's skyline was very nice. We met our tour guide, Manuella, at a late afternoon meeting and found that the group consisted of about 40 people. That was a little larger than I was hoping for but Manuella was excellent and handled things very efficiently. (She quickly made sure that all the rest of our hotels would have king beds.) After some introductions and overviews, we had an opportunity to sign up for any optional tours we wanted. 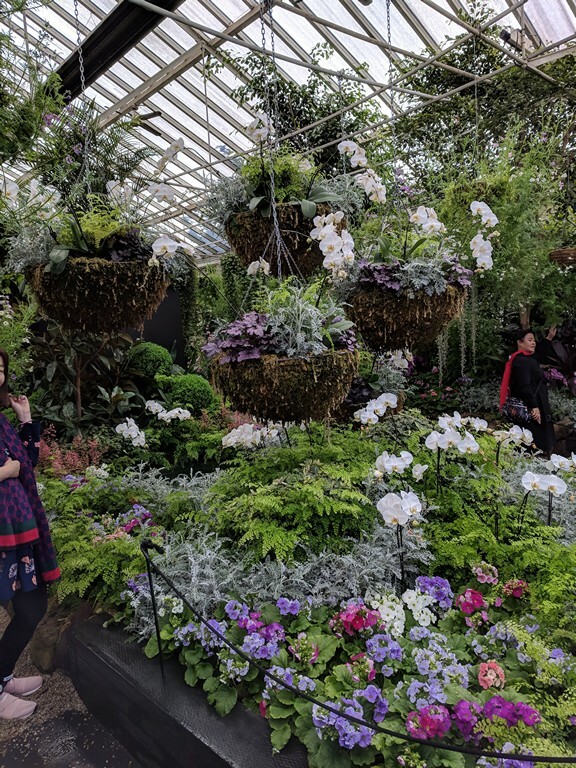 This worked out well because there were many things to do in each of the locations we visited, and different folks wanted to do different things. I'll mention the optional tours we took as they come up. 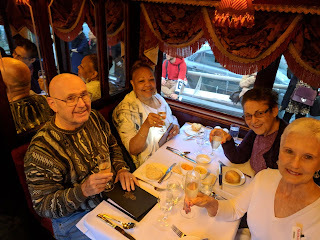 That evening the whole group met at a tram stop just across the river for Dinner on the Tram. It was an actual street car that was a rolling restaurant. We enjoyed a delicious filet minion dinner while touring some of Melbourne! 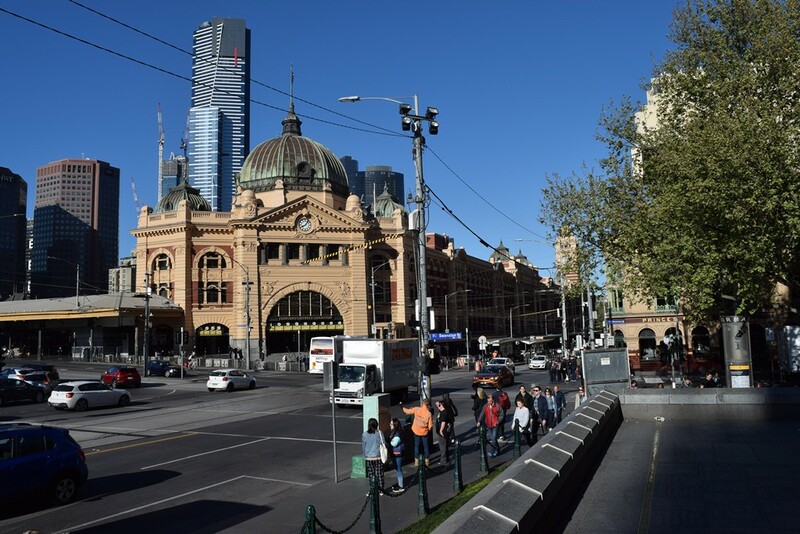 The following day began with a bus and walking tour of Melbourne. It reminds me of San Francisco in that there are many beautiful old buildings and it has a cosmopolitan feel to it. We saw cathedrals, train stations, government buildings, parks, war memorials, botanical gardens and more. The walking tour included some of the "Laneway's" in the downtown area. 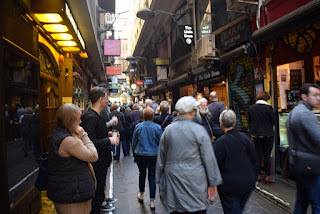 They are mostly little shops, many small restaurants, cafe's or coffee houses. No cars are permitted and they just teem with activity. 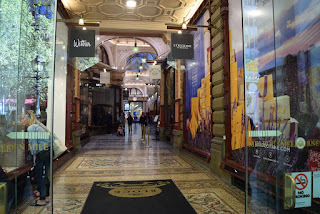 We then walked to some buildings they call "galleries". 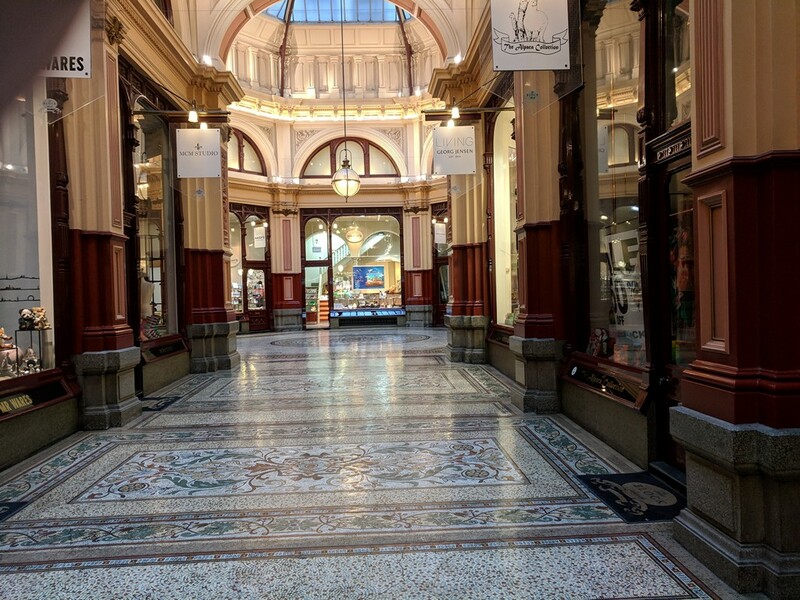 They are enclosed buildings with many shops in them, and were built quite some time ago. We were too early for most of the shops to be open which made it easier to photograph. (For which, I'm sure he was grateful, as I couldn't do any shopping! D) They were really very beautiful. Here are a few other photos from the morning tour. We were still tired from our trip and the rest of the afternoon was free. We rested up some and took a ride on the street car system around the city. All the street cars in the downtown area are free. That evening we walked across the river and had dinner on our own. While many meals were provided, we were on our own for about half. It was a good thing because all the heavy, rich meals could take a toll on us. 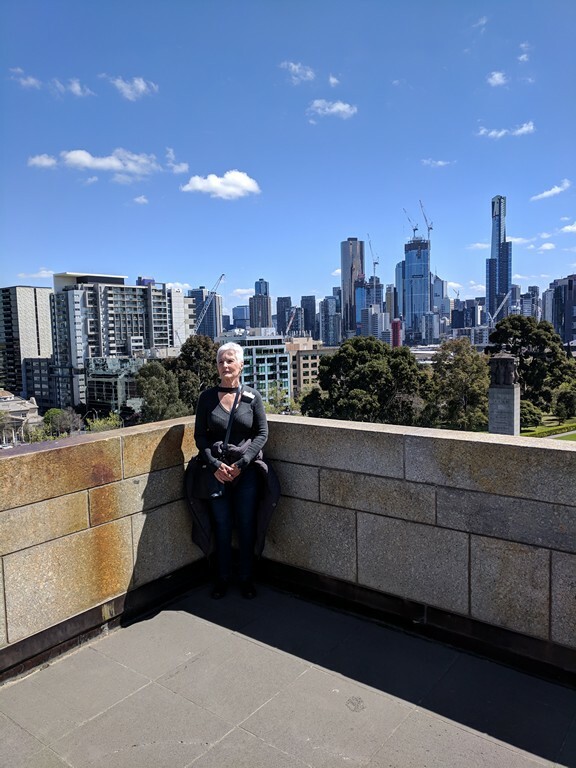 We enjoyed our time in Melbourne and found it to be a fine place to visit. It was a bit cool there because it is on the south coast of Australia, but the next morning found us at the airport on our way to Cairns in the sub-tropical far northeast of the country. 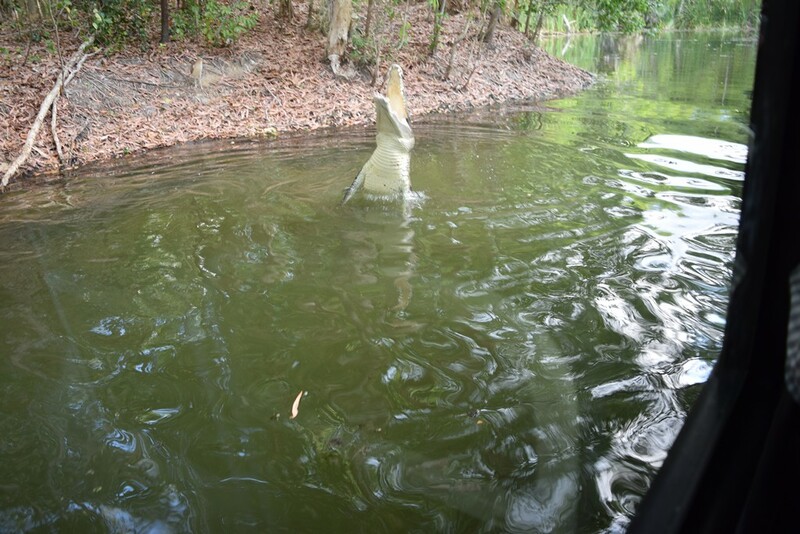 Upon landing we were taken immediately to Hadley's Crocodile Farm north of town. Cairns is a whole other world from Melbourne. It was like going from San Francisco to Honolulu, except Cairns is a much smaller town. 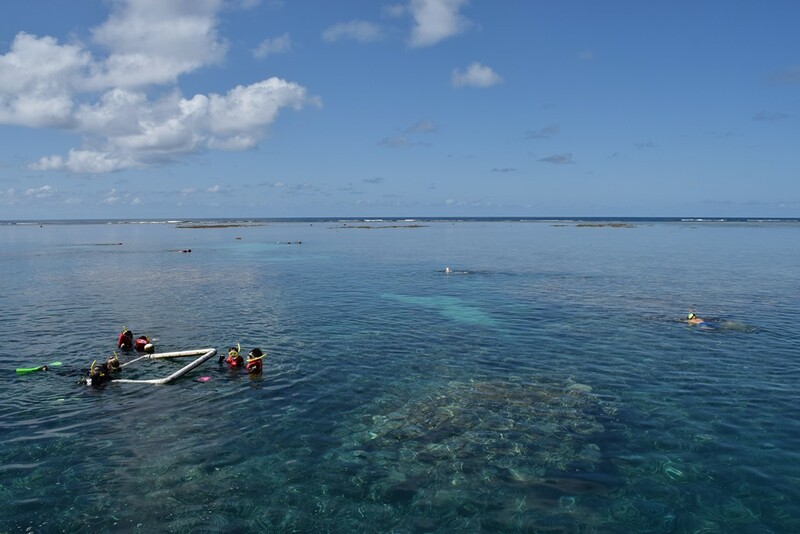 It is primarily a tourist town for people visiting the Great Barrier Reef. At the crocodile farm we took a boat ride that reminded us of the River Cruise in Disneyland, and was about as long. The difference was that the crocodiles were real. 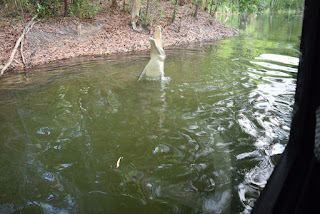 In addition to crocodiles there were many other animals available for us to see. 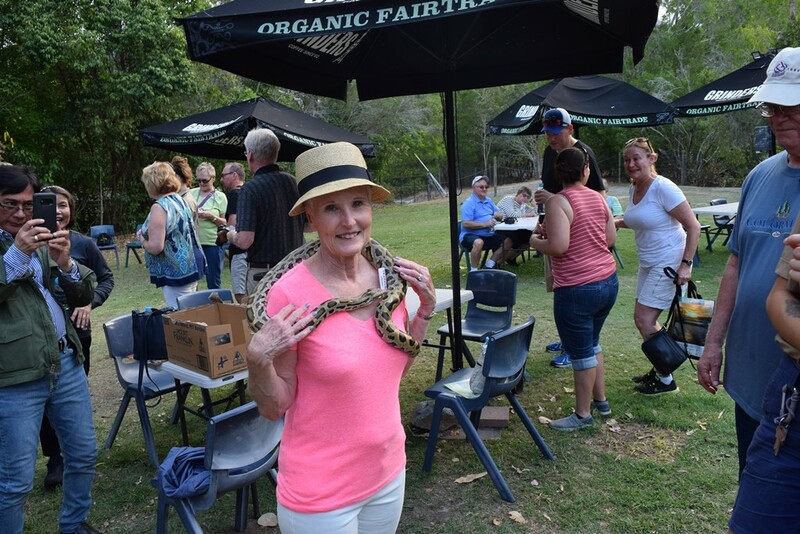 Dianna got to experience a life long desire to hold a live koala. 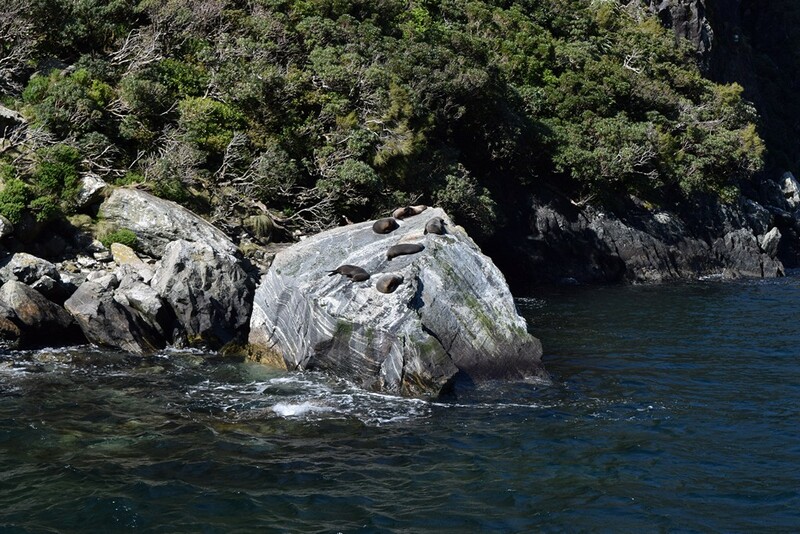 Here are some of the other critters we had a chance to see. Then it was back to our hotel, The Millenium, and dinner on our own. I chose a fish and chips place in a food court, and Dianna had chicken schnitzel. The next morning we took our trip to the Great Barrier Reef. 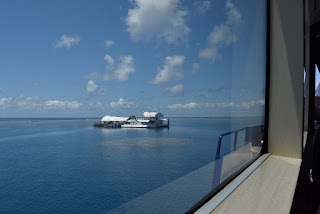 The boat that took us was a high speed catamaran that made a stop at Green Island to drop off passengers who spend the day at that resort island. The reef was about 40-50 miles offshore. The tour companies have permanently anchored platforms in various places. I suppose this is to prevent random damage to the reef, and also to provide all the various "toys" you can avail yourself of there. We chose to snorkel and take the "submarine tour", which is very much like the submarine ride at Disneyland, except it is a real reef you are looking at. 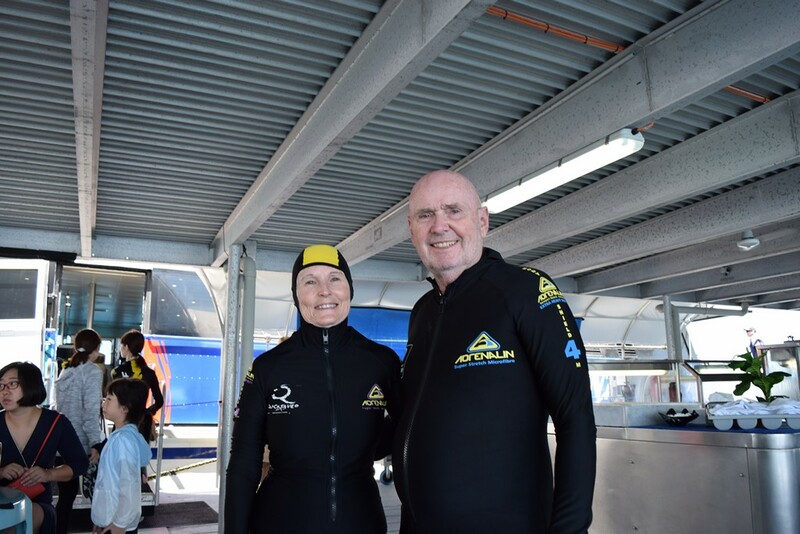 They provided lycra suits to wear that prevented jellyfish stings. There were not supposed to be any at that time of year, but the suits also served the purpose of preventing sunburn and kept us warm as the water was chillier than we had expected. 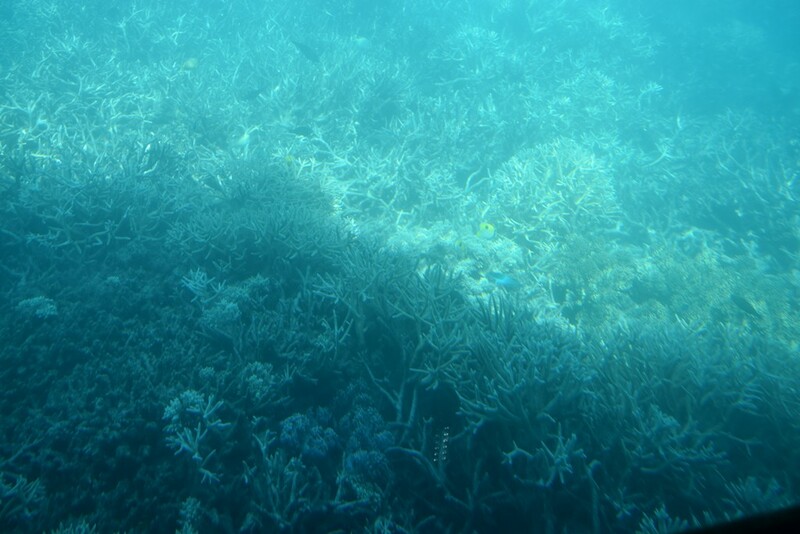 Although we enjoyed our experience, we were disappointed in the reef itself. The colors were mostly muted grey and looked dead. The guides said that was because of the makeup of the water and not because they were dead, although there are issues with parts of the reef dying off because of global warming issues. This photo was taken from the "submarine". At low tide much of the reef is above water. I took this photo after the tide had begun to come back in. At the lowest tide there was much more visible. 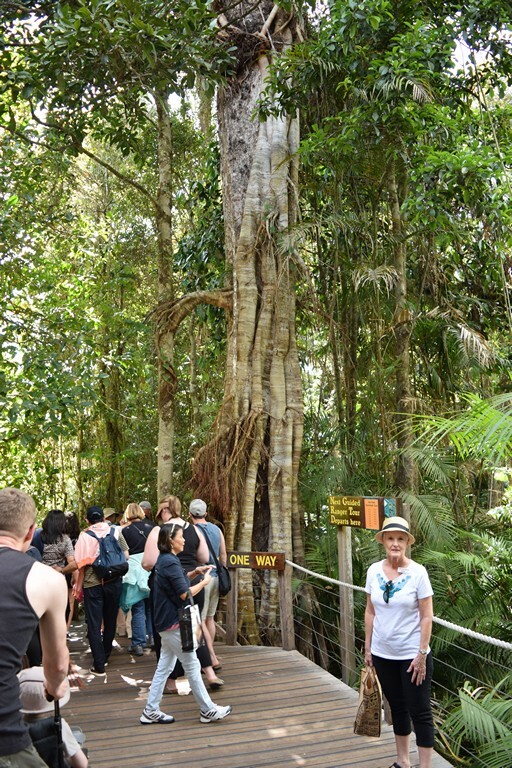 The following day we took an optional tour to Kuranda, a village in the rainforest on the tablelands above Cairns. 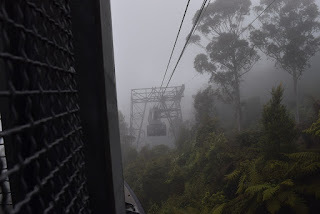 The trip up was by Skyrail Cableway. 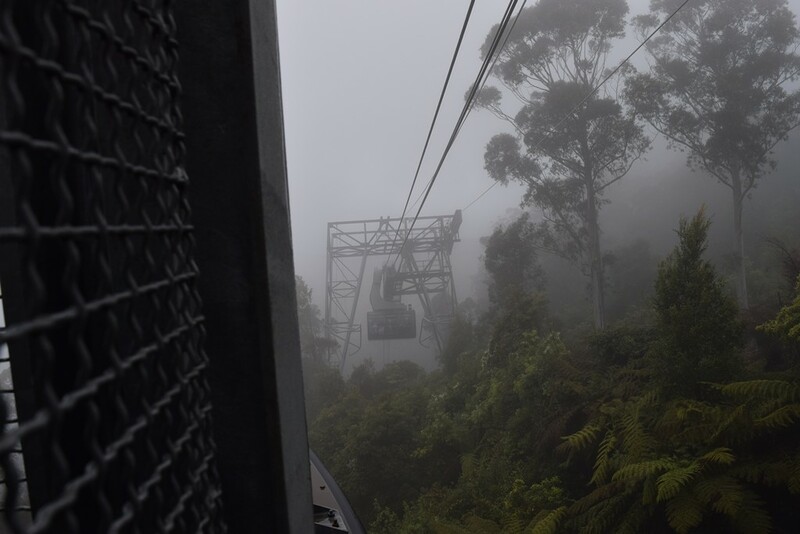 There were three separate sections of cableway, which totals about 4 1/2 miles. 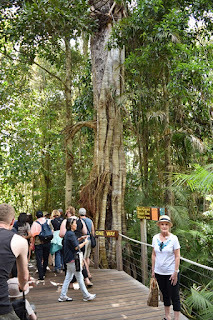 At the first was a walking tour of the rainforest with an excellent guide. The second stop was overlooking some of the waterfalls in the gorge, although this photo was taken from the cable car. The village of Kuranda itself was something of a disappointment. Originally it was a small native village, but in the 60's a new group moved in -- hippies. At first they just lived there but over time they aged and now it has become a tourist and art center with some native artisans still making and selling beautiful art pieces. 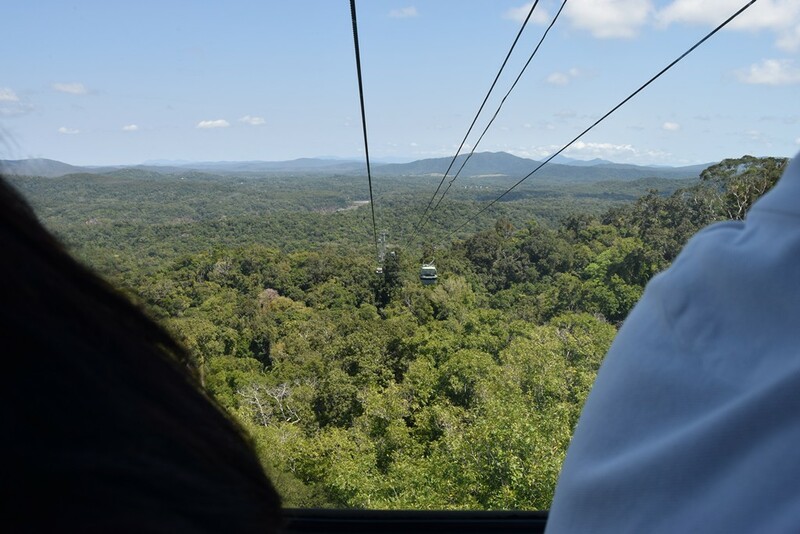 There are shops and restaurants to service the tourists who visit daily, but nothing special other than the location in the rain forest. We had a nice lunch in a crepe cafe and bought a few souvenirs. 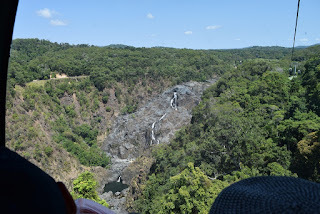 The trip back down to Cairns was on Kuranda Scenic Railway. It was built in the 1880's to serve the mining industry, very similar to the Durango-Silverton railway in Colorado. We made several stops along the way as we rode back down the canyon to town. 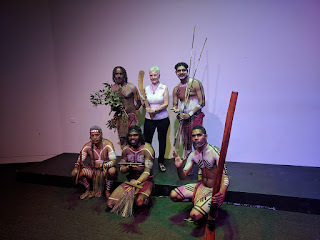 That evening we were taken to the Tjapukai Cultural Center near Cairns. Although it is, of course a touristy thing, we did learn something of the original people of Australia. 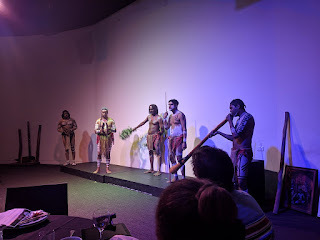 The Tjapukai tribe was one of about 500 tribes living in Australia when the Europeans first arrived. The same thing happened there as in the US as Europeans brought disease and colonized the land. They did some of their dances and ceremonies for us, and served a buffet dinner which included optional crocodile, emu and kangaroo. We tried all three and thought they were different & pretty tasty. After dinner they posed for anyone who wanted photos. I always take these things with a grain of salt. While I appreciate the keeping alive of their heritage, I always wonder what jobs these guys hold when not performing. Probably lawyers and bus drivers and accountants like everyone else. 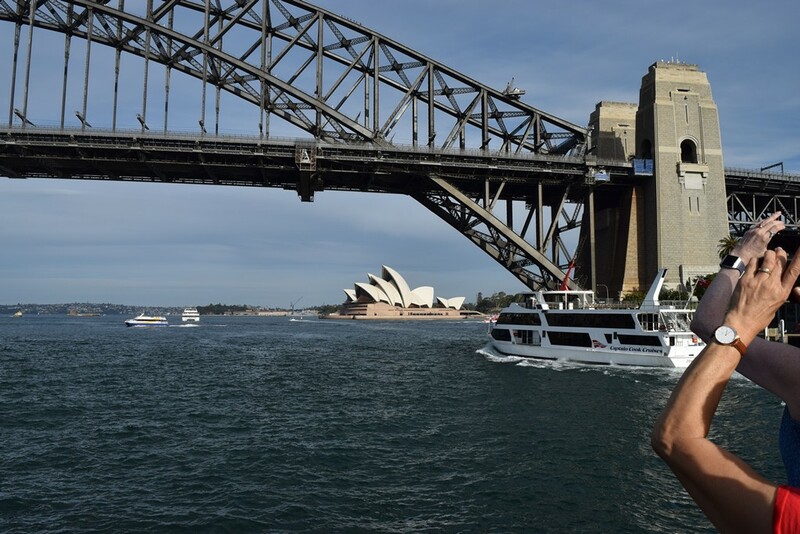 The next day we flew to Sydney, the largest city in Australia. 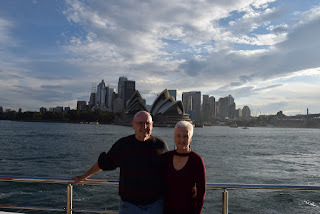 We stayed at the Hyatt Regency overlooking Darling Harbor (a side harbor off Sydney Harbor) in downtown Sydney. Sydney had none of the eclectic feel of Melbourne, but instead felt more like any city you might find anywhere. 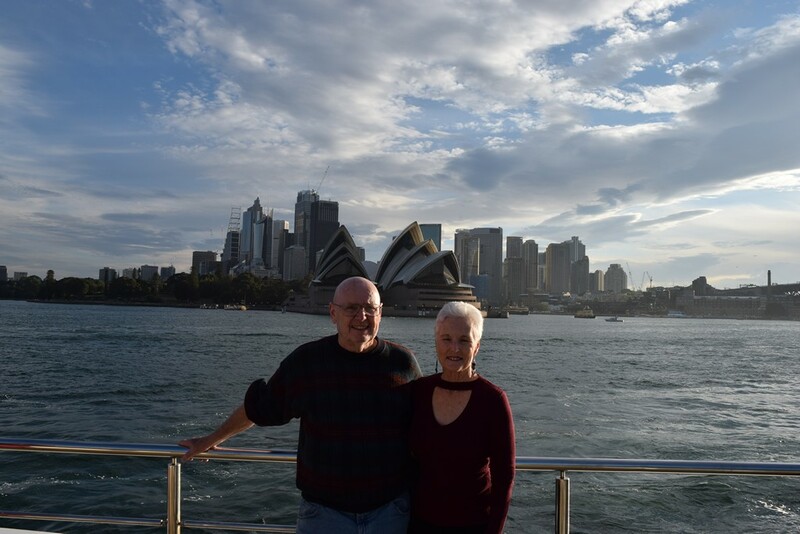 The first night we had a dinner cruise in Sydney Harbor where we got to see some of the major sights including the Harbor Bridge and the Sydney Opera House. The evening was very nice, but it was also the end of our good weather. Melbourne and Cairns had been very nice early spring weather, but rain caught up with us the next day. 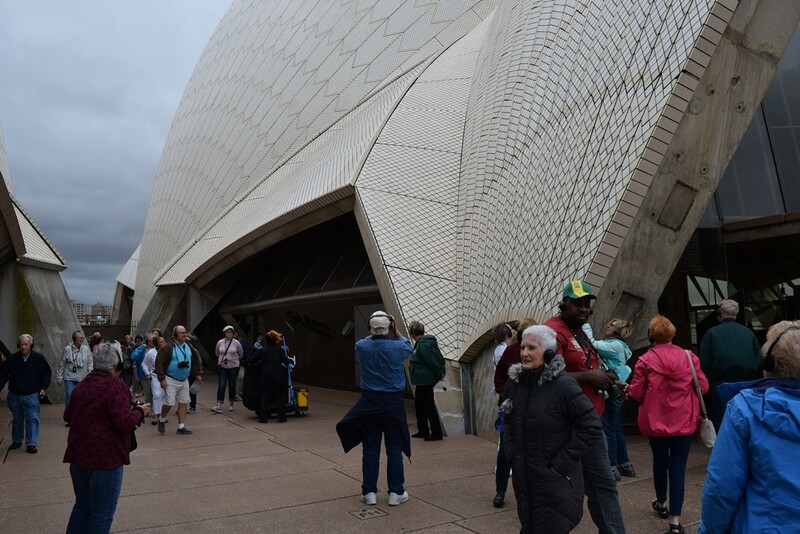 We took a city tour with several stops, including a tour of the Sydney Opera House. It is a very impressive structure. We were able to visit the auditoriums and see where they have performances. Much better photos than any I took are online if you are interested. Here is a photo to prove that at least Dianna was there. 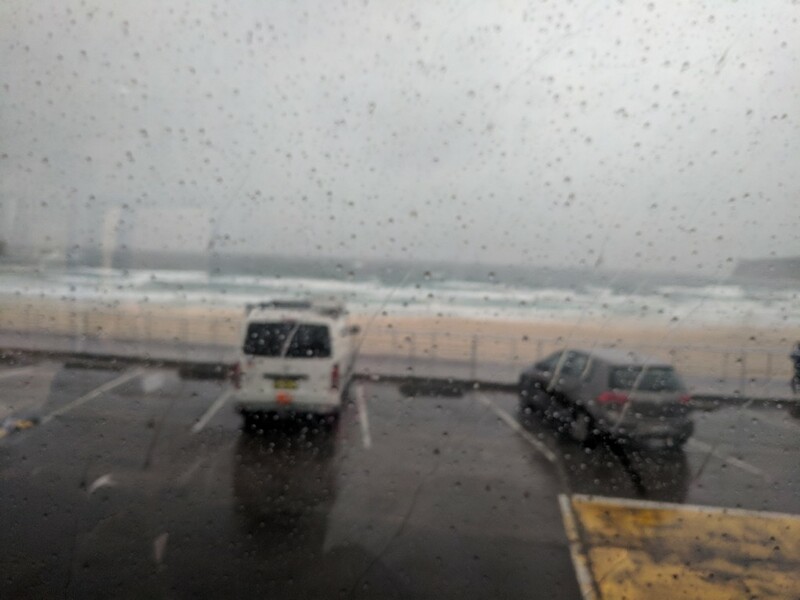 The bus tour stopped for a lifeguard demonstration and lunch at Bondi Beach, a world famous surfing and skimpy bikini beach south of Sydney. The lunch was very nice but the weather made viewing the beach a major disappointment. This is probably one of the very few photos of Bondi Beach with absolutely no on on it. 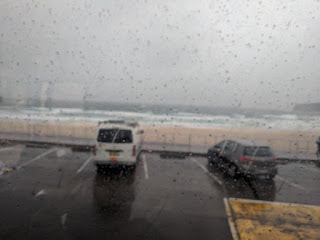 This was taken from inside the bus as the rain was blowing sideways. 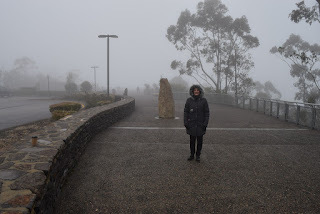 The next day we took another optional tour to the Blue Mountains. These are the mountains closest to Sydney and I'm sure they are quite pretty when you can see them. 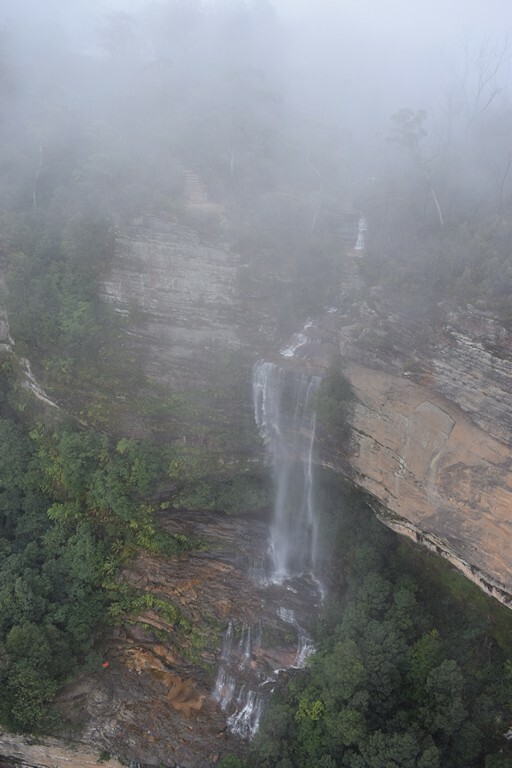 Unfortunately, our bad weather continued and we had fog and drizzle for most of our trip. This is the view from one of the scenic overlooks. We were taken to an area where they have three "rides" to view some of the more spectacular scenery. 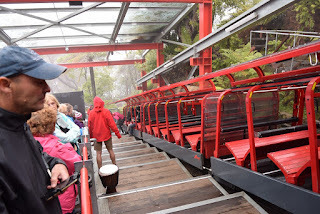 There is a cableway that takes you across a canyon, a "worlds steepest railway" ride that takes you down into that canyon, and a cable tram that brings you back up from the canyon. 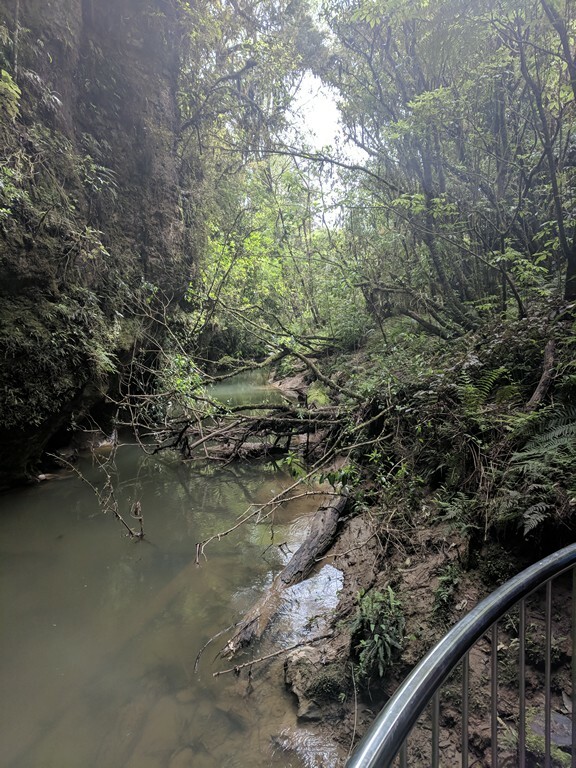 In the canyon you can hike a trail through the rain forest that connects the two canyon stations. We actually enjoyed it, riding up and down on each, and hiking between the stations both ways. 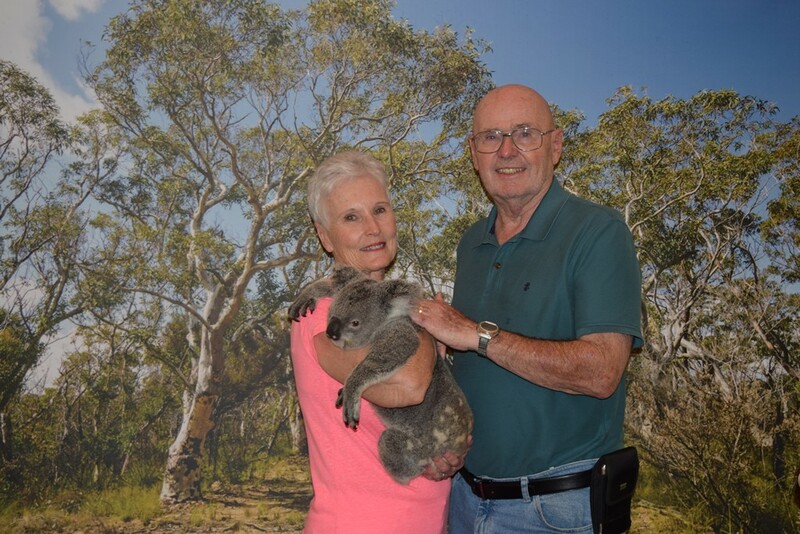 After lunch in a nearby town, the bus took us to the Featherdale Wildlife Park on the way back to Sydney. It was basically a private zoo but we got to see some of the native animals closer up than in other places we had been. 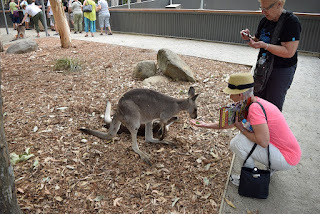 We saw kangaroos, wallabies, cassowaries, emus, koalas, wombats, penguins (yes, they have them in Australia), dingoes, birds and critters of all kinds. I'm not going to include photos as anyone interested can find much better photos than mine on the internet. The next day we relaxed and didn't do much of anything. We explored a bit on foot but that was about it. 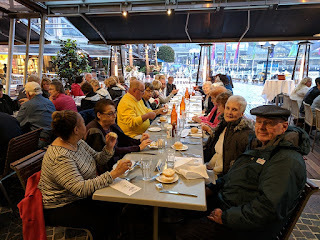 That evening we had our end of Australia dinner at a very nice restaurant along Darling Harbor where we said goodbye to many friends we had made and to our tour guide Manuella. The next day we flew to Queenstown, New Zealand and were met at the airport by our guide Alan. Only about half of the group we were with in Australia were on this part of the trip so our group was only about 20 in total. It was a much more enjoyable group size. After being picked up at the airport, we were first taken to a small tourist town for about a half hour stop to visit shops, but no one seemed interested in it. Fortunately it didn't last long before we were taken into town to our hotel. After checking in at the Millenium Hotel and getting settled, we were taken to The Boat House restaurant for a great dinner. 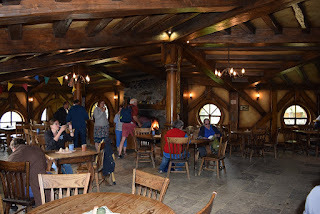 They were open only for us and it was a very nice meal with great scenery. 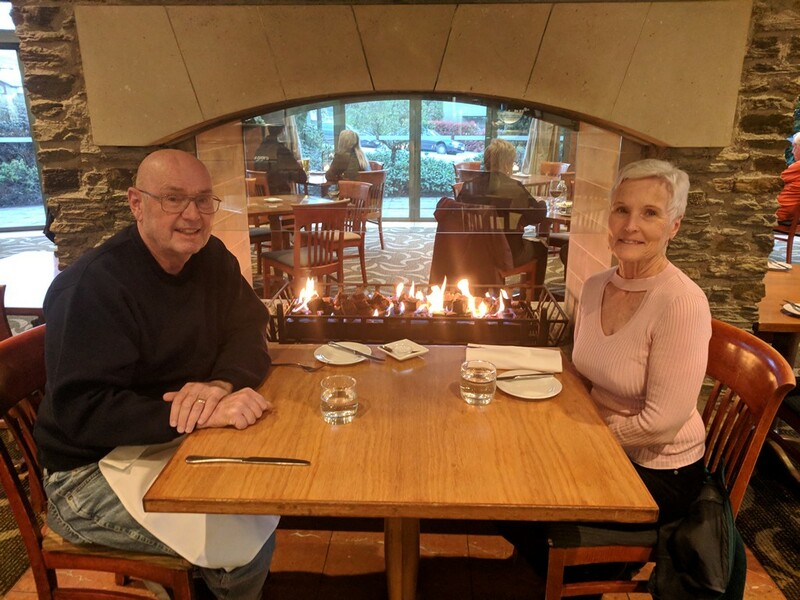 As it turned out, this was October 12, our actual 50th anniversary. Everyone congratulated us and drank a toast to us, and there was a free bottle of champagne waiting for us when we returned to the hotel. Yes, that is snow on the mountain. In fact, there were snow flurries in town that afternoon. Queenstown is in the center of the Southern Island and has become quite a tourist mecca, for good reason. 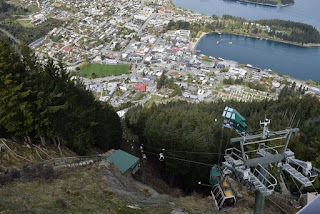 The scenery is magnificent and there are several ski resorts nearby. The mountains are known as the Southern Alps and were where much of the Lord of the Ring and Hobbit outside scenes were filmed. Amazingly beautiful area. 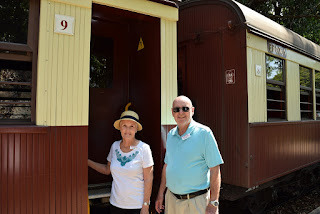 We were exhausted from all our travels and the next two days were free for us to explore on our own or take any optional tours. 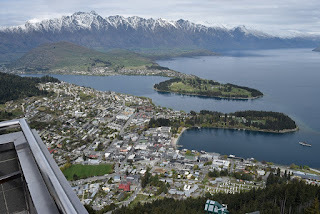 We elected to stay in Queenstown the next day and just take it easy. Unfortunately we discovered Dianna has left her purse on the bus the night before, but Alan was able to have it returned to the hotel. Meantime we walked over to the Skyline and rode up to get a good view of the area. They have mountain biking from there, as well as other outdoor activities, but the big thing for us was the view. You can see how close to town the Skyine is. It is a small town and everything is in easy walking distance. These were hanging on the wall in the tram station. Can you guess what they are made of? 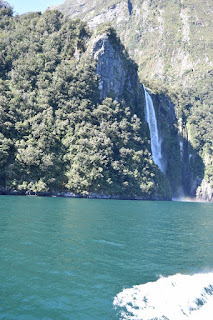 The next day we arranged to take a tour to Milford Sound, a fjord on the eastern coast. Most of our group took that tour the day before. They left at about 8 in the morning and did not return until 7 at night. The bus ride over the mountains to the coast and back was the major part of the trip, with the boat ride on Milford Sound only accounting for around 2 hours. Here is where we ate breakfast at the hotel. We left at the same 8 AM time and had gone only 10 miles or so around the lake when we came upon an accident that had just happened. A tour bus that was 5 minutes ahead of us had come around a corner and met a car in his lane head on. A couple more tour buses ahead of us got through but the first fire engine came screeching up and pulled in just ahead of us, blocking the road. 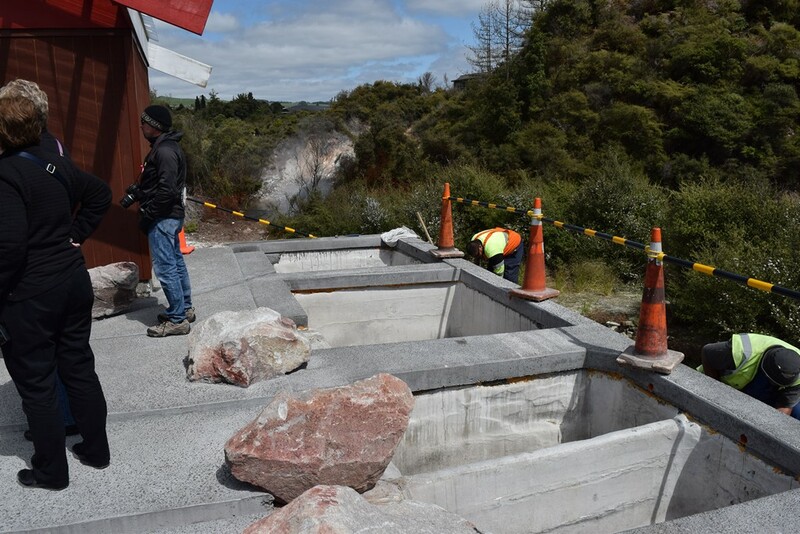 Our driver went out to check on when they thought they might reopen the road, and when he returned he said it would be at least 3-4 hours. We had to turn around and cancel the trip. He also told us no one was hurt in the accident, but we learned the next day that the driver of the car in the wrong lane was killed on impact. Sad. On the way back into town the bus driver, who was also a tour guide himself, offered to see if he could arrange a trip by air to Milford Sound for anyone who wanted it. Of course, they refunded the cost of the bus tour, but the air tour was much more expensive. 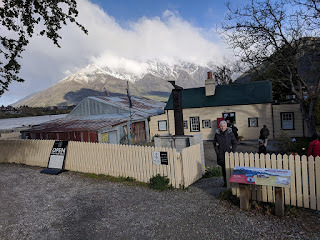 We decided that we would never be back to this part of the world again, and money was not going to hold us back from seeing it, so we booked the tour for that afternoon. It turned out to be the best adventure of our whole trip. 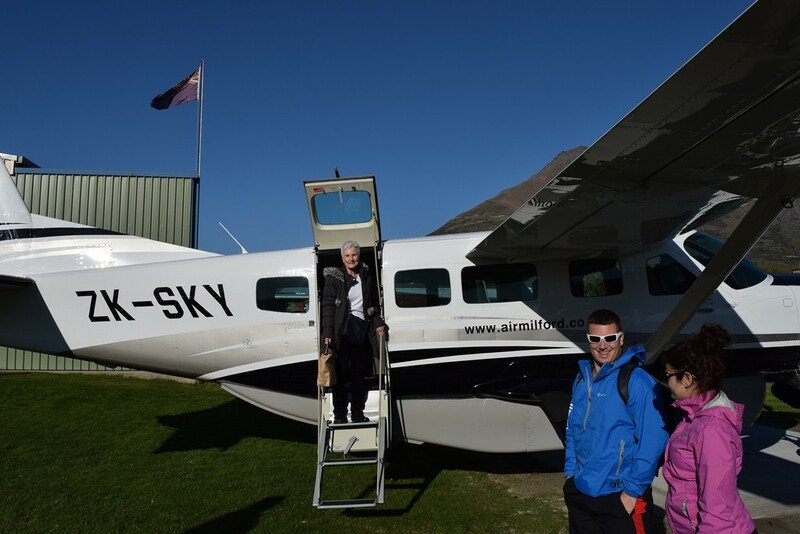 Air Milford operates 3 Cessna Caravans, turbo prop airplanes that hold about 9 passengers plus pilot. I got to sit in the copilot's seat on the way out. To say the scenery was magnificent is an understatement. We did not fly over the mountains to the coast -- we flew among the mountains. 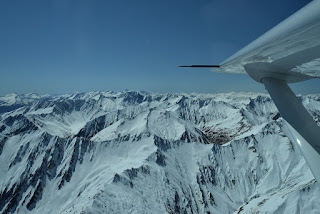 It reminded me very much of our glacier flight in Alaska, but these mountains were even more beautiful. Photos do not do it justice as we flew through passes with scenes like this on both sides of us. That is Milford Sound out ahead of us. 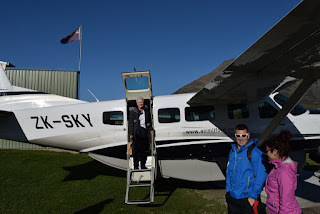 After landing we took a short nature hike with our pilot to the tour boat terminal where we began our tour. 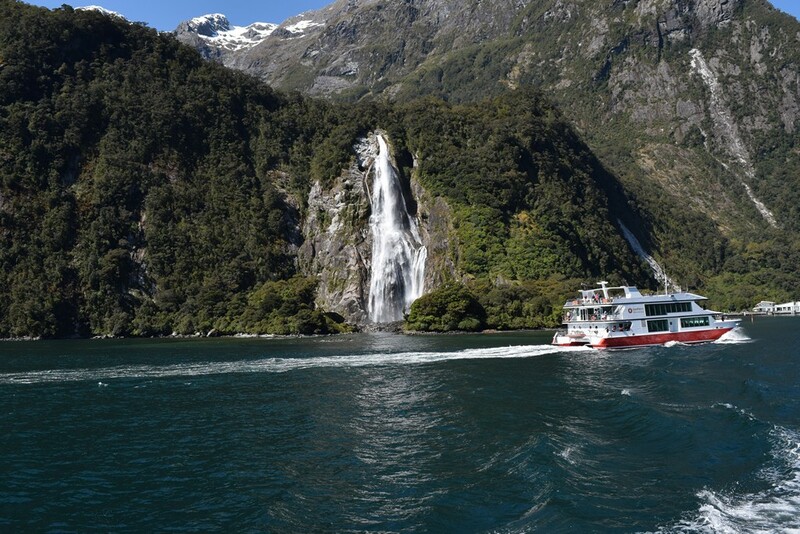 Milford Sound is actually a fjord, just like the ones in Scandinavia, which is a glacier carved deep valley in the side of the coastline. 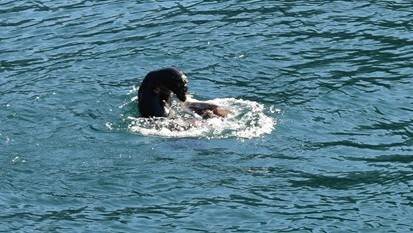 and a seal playing with an octopus he had caught. 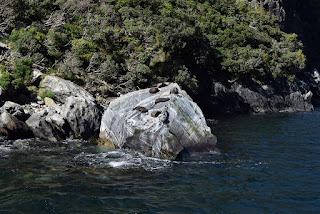 The boat tour was enjoyable, and the scenery was great, but after the flight over we were a little underwhelmed. Still, all in all, it was a great tour, especially the flight over and back. We were back in our hotel late by afternoon. 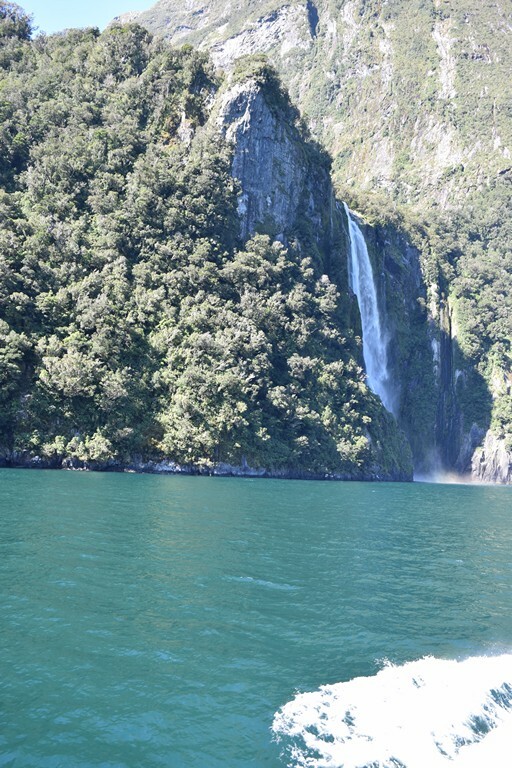 That was certainly the best way to visit Milford Sound instead of a 10 hour bus ride. 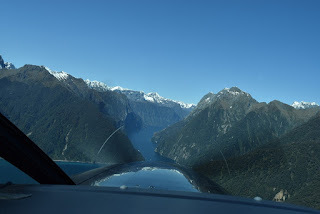 The following day we flew from Queenstown on the South Island to Auckland on the North Island, changed planes and flew to Rotorua, about 75 miles to the south. 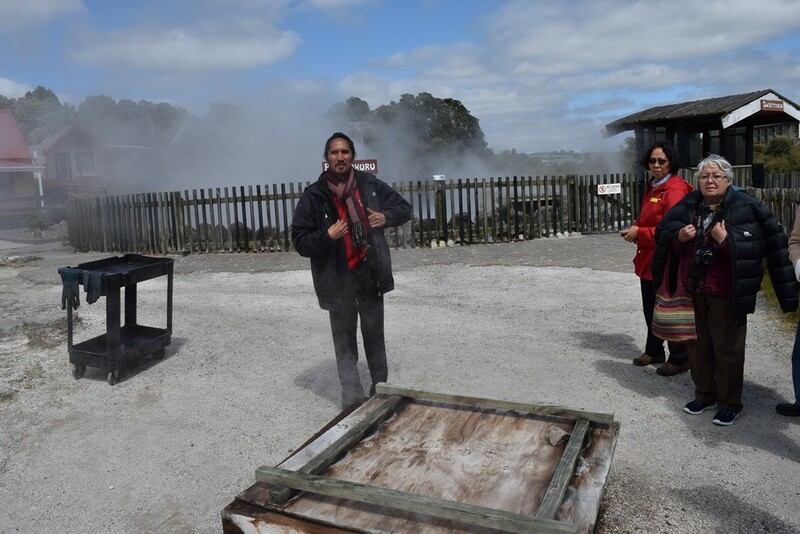 Rotorua, a city of around 70,000, is the center of Maori culture in New Zealand, and something of a tourist mecca. 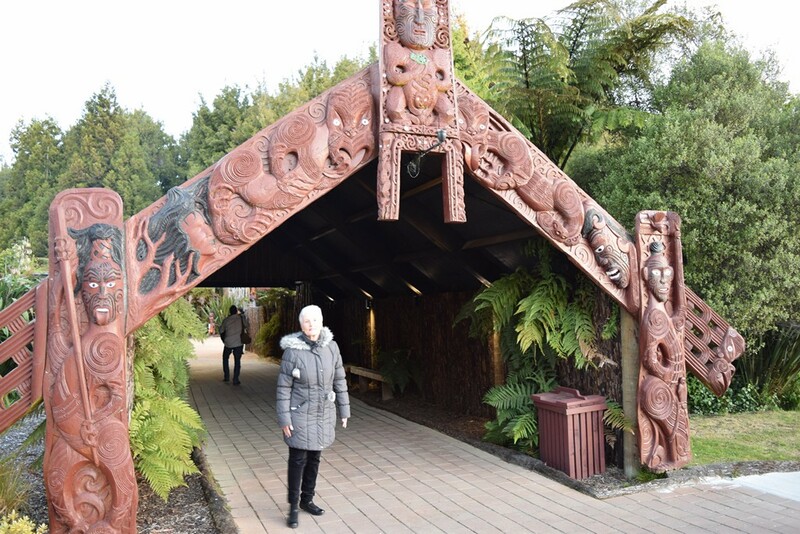 Most of the residents of Rotorua are Maori, but you would never know it. 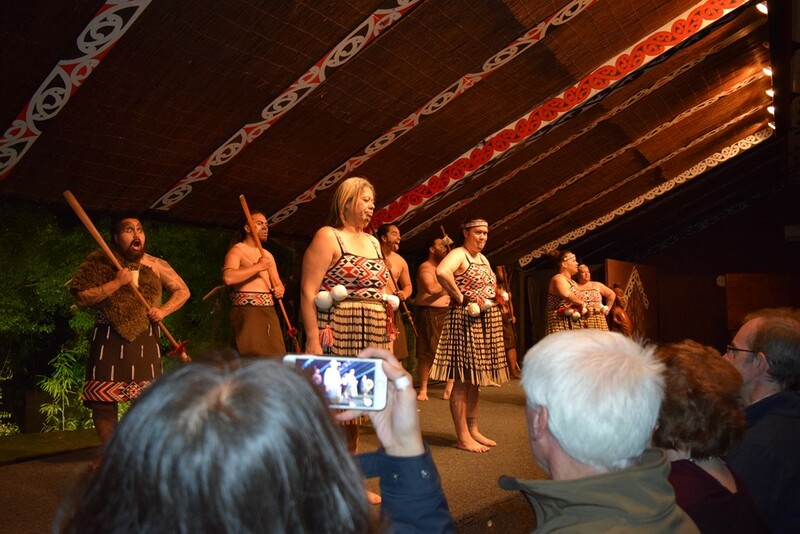 There is not much to distinguish a Maori from a Westerner anymore. 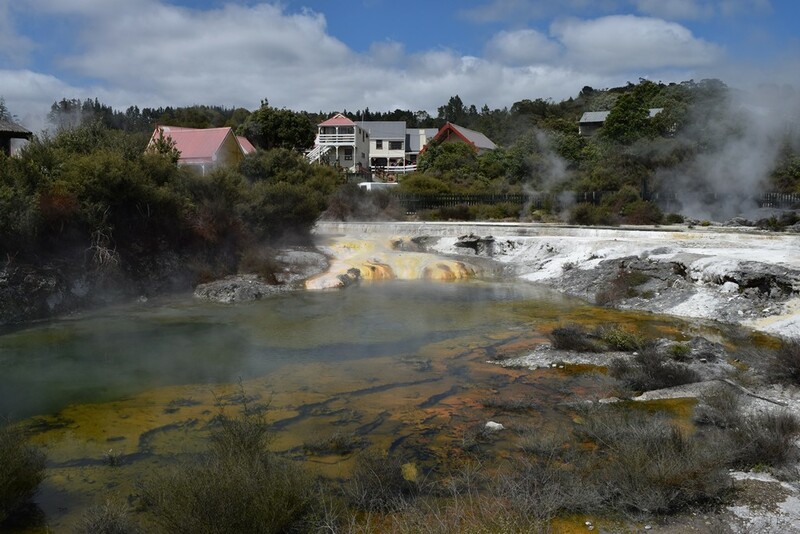 The town of Rotorua is built in a very active volcanic area, similar to Yellowstone. There are steam vents, mud pots, geysers, and hot springs everywhere, and the smell of sulfur fill the air. There are no actual volcanoes now, but there is evidence of them around. In fact. 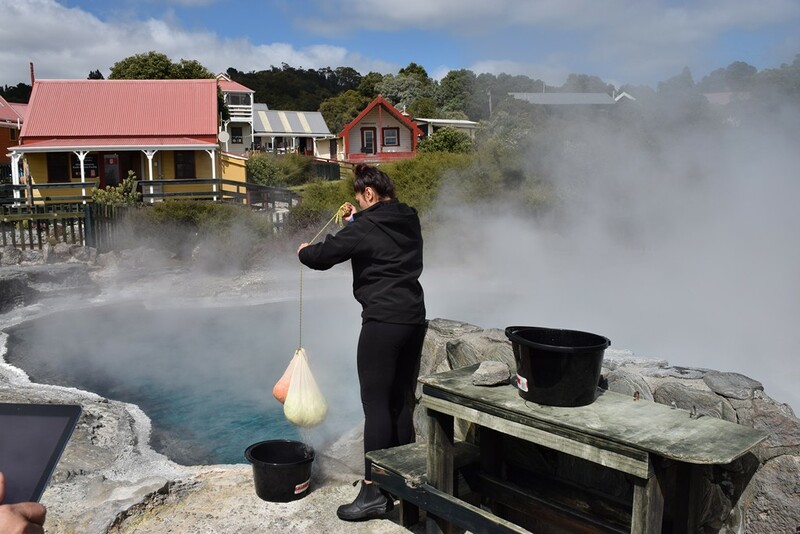 Rotorua, just like Yellowstone, is in an ancient caldera that collapsed several hundred thousand years ago. 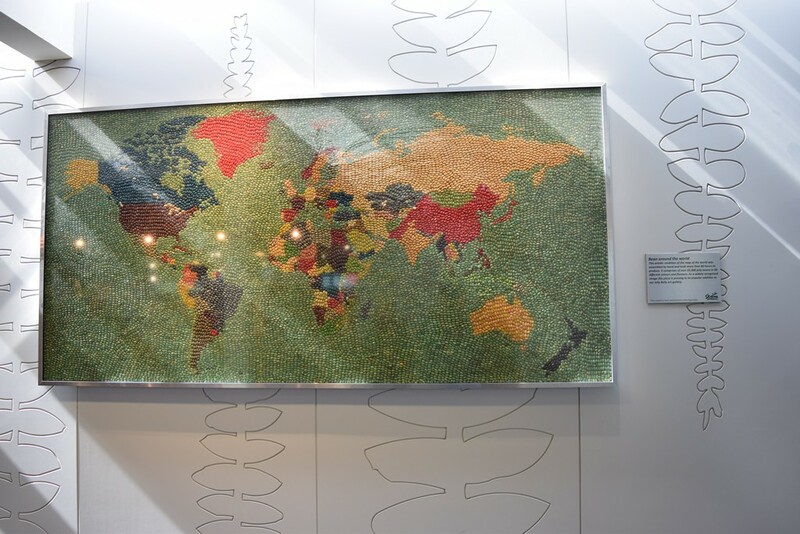 We learned something very interesting when we arrived there. I knew that the native people of Australia were some of the oldest cultures on earth. They had migrated to Australia around 65,000 thousand of years ago, probably from Indonesia, and been cut off from the rest of the world for most of that time. 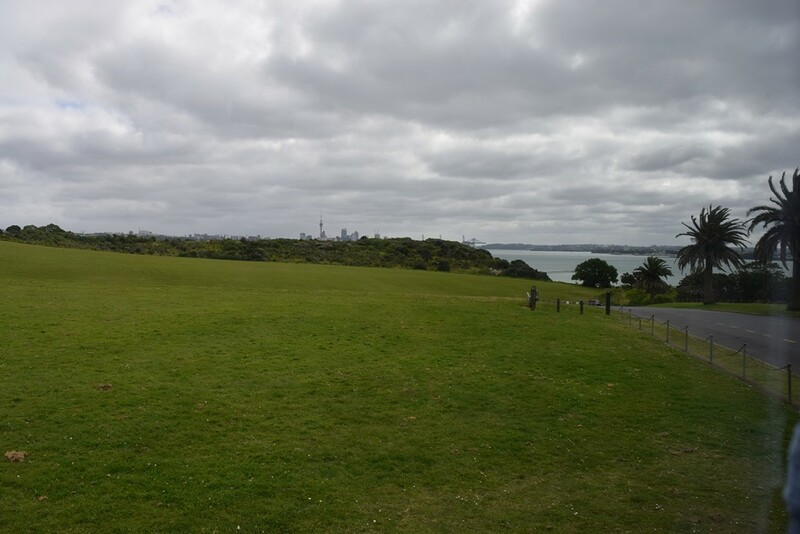 The Maori who settled New Zealand were an entirely different group of people. They are Polynesians who came from the Pacific islands. Some may have come from as far away as Hawaii or Easter Island. They arrived in ocean going canoes around 1250-1300. Their culture bears little resemblance to that of aboriginal Australians. 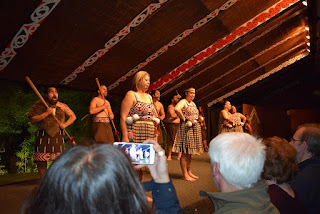 After a bus tour of town we checked into our hotel, another Millennium, and soon left for a dinner and show at the Tamaki Maori Village. It is built strictly for tourists. They have warriors and dancers, women and cooks, who give you a bit of a show in the outdoors at first, then take you to various places where they show you something of their culture. 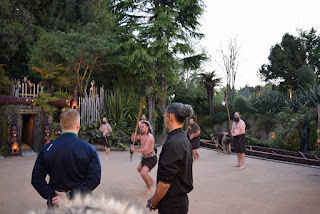 The next to the last stop was at a pit where they were roasting our dinner under palm leaves (think luau), followed by a show where they sang and danced for us. Finally we were taken to a building were we were served the meal they had prepared. It was quite good. The next day we made several quick stops around Rotorua. 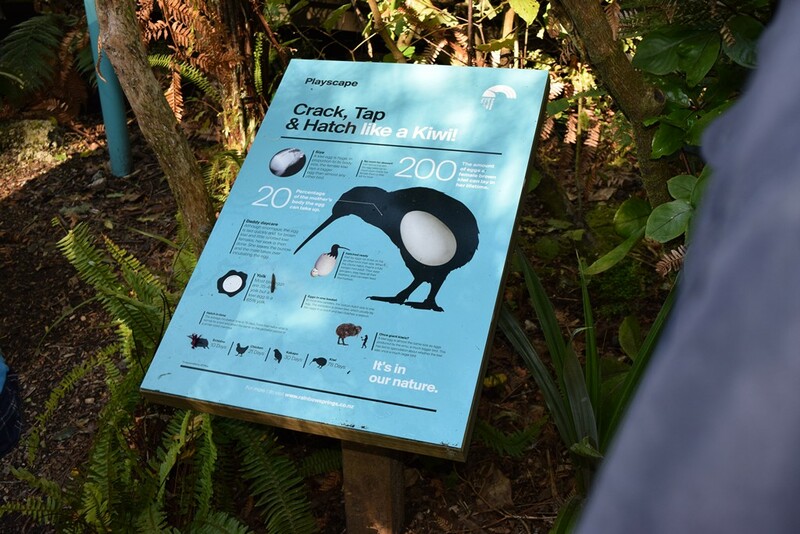 The first was at Rainbow Springs, a natural springs that has been turned into something of a zoo. This is a stuffed Kiwi. 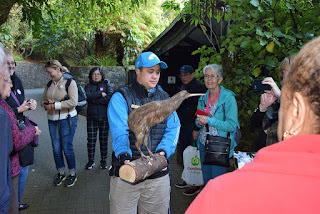 They are a flightless bird native to New Zealand. It is related to the emu. Their numbers have been reduced over the years but they are no longer on the endangered list. They lay a very large egg for their size. The next stop was another tourist trap, the Agrodome. 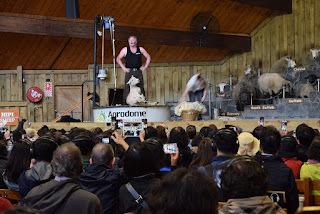 There is a show with a funny MC who shows all the different breeds of sheep, and then shears one for you. Then you all walk outside to watch a sheep dog do his thing. And yes, there are gazillions of sheep in New Zealand. The next stop was at the Whakarewarewa Thermal Village. 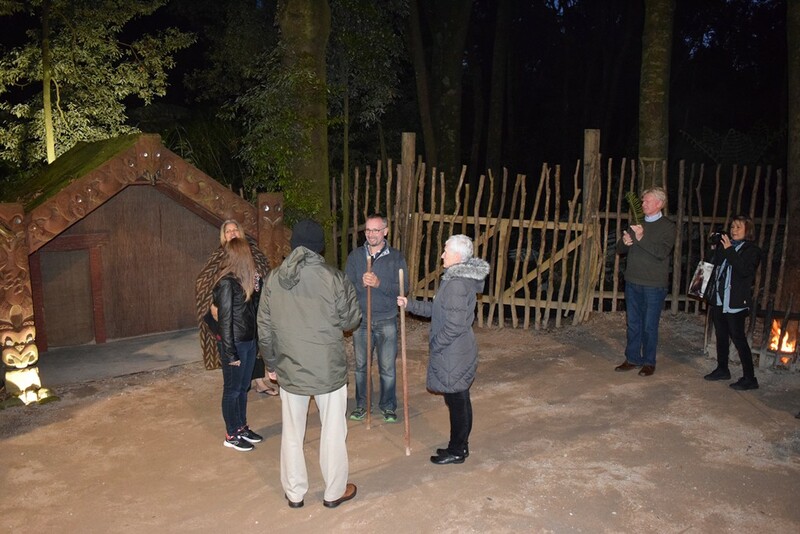 It is only open to tour groups like ours because it is an actual village. 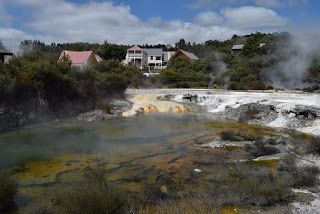 Native Maori have been living there for hundreds of years, right around and among the hot springs. 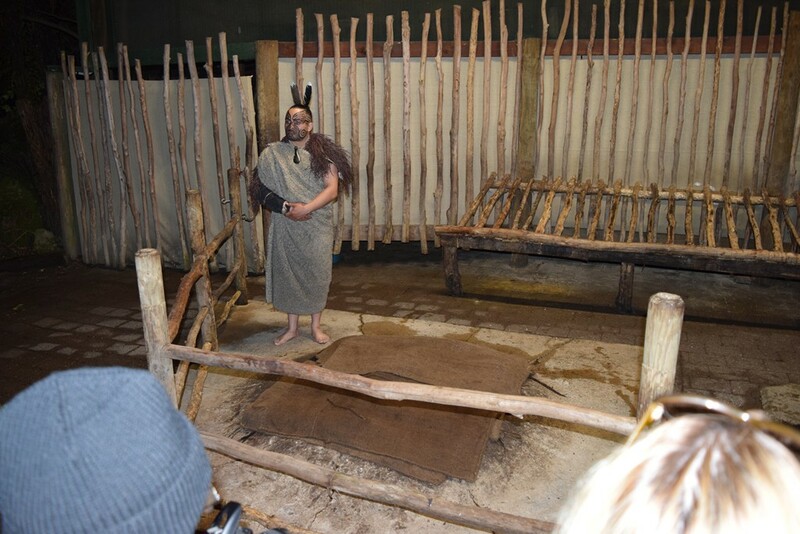 They have adapted them for heating, cooking and bathing. Of course, many of the people who live there go off to regular jobs during the day, but they return to their homes at night. Hot pools occasionally dry up and new vents form. It is quite common that a vent opens up beneath a house which causes them to relocate. Can you imagine living among the hot pools in Yellowstone? This woman had been cooking something in a boiling hot spring. This was not staged for our benefit. Her food just happened to be done while we were there. These are the communal baths, filled by diverting water into them. Looks just like Yellowstone, doesn't it? 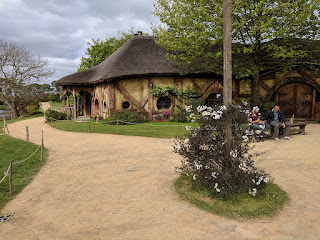 That afternoon we again had the opportunity to choose from optional tours, and we decided to go to Hobbiton, about an hour bus ride away. 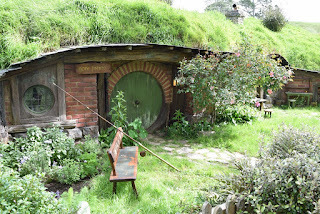 Yes, it is the movie set where the outdoor scenes for the movies Lord of the Rings and The Hobbit were filmed. It quickly became apparent why Peter Jackson chose his home country for the setting of his movies. He flew all over New Zealand until he found this location and made arrangements to build the movie set for Rings. It was done mostly out of styrofoam and other temporary materials, and it was completely removed after filming. 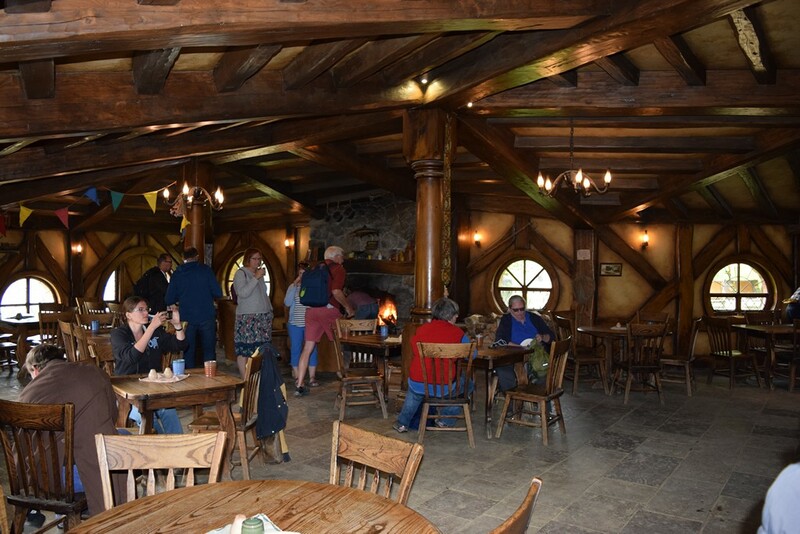 After the movie came out fans sought out the location, just to say they had seen it. When Jackson decided to do The Hobbit, the land owner made a deal with him (a partnership of sorts I believe) to build the set out of something more permanent, and then make the place available as a tourist spot. 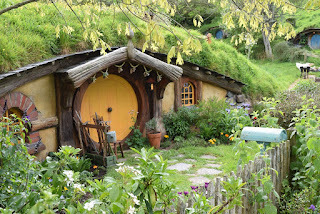 If you are a fan of those movies, you would enjoy visiting. 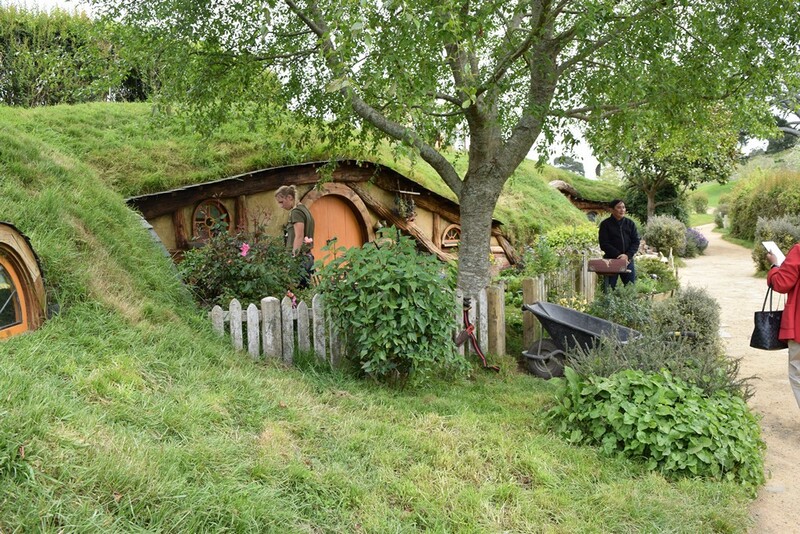 Except for the Green Dragon Inn, all the Hobbit Holes (houses) are mostly exterior only. Still, the level of detail was amazing, and the site itself idyllic. Yes, I took way too many photos, but it was quite interesting. 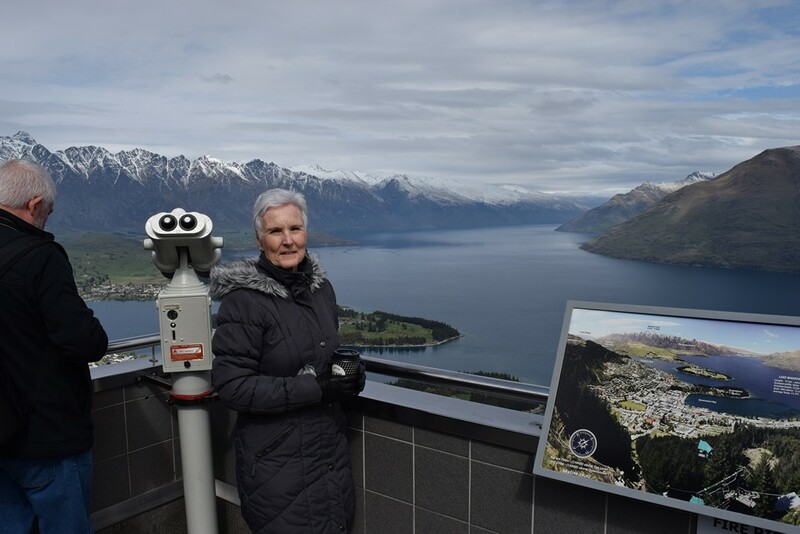 The following day was our final day of sightseeing in New Zealand. It consisted of a bus ride from Rotorua to Waitomo to visit the Waitomo Glow Worm Cave. We have been in many caves so this was not all that special from that standpoint, but the unique aspect was that there is a small stream that flows into the cave, which is how it was discovered, and it is inhabited by something called a glow worm. They are actually a type of gnat known to live in damp caves or other humid places. They lay their eggs attached to the ceiling of the cave, and during both the larval and imago stages of their life cycles, they are luminescent. In several places in the cave the lights were dimmed and it looked like a starry sky. Quite unique. 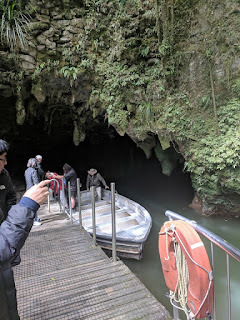 We finally came to a very dark area where we boarded a small boat by flashlight, and the guide pulled us through the grotto using ropes attached to the walls. We could see nothing but the glowing spots of light as we glided through. 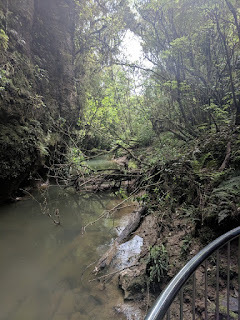 Soon we reached the exit, which was also the entrance where the stream flowed into the cave. 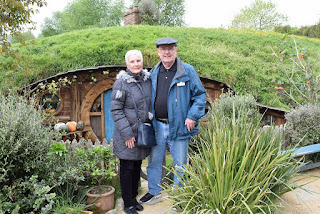 From there we continued to drive through the gorgeous green, rolling hills of the New Zealand countryside, seeing more sheep than anyone thought possible, on our way to Auckland, the largest city and capitol of New Zealand. When we arrived we toured the city by bus, but frankly it was just a city. I only took one photo because the only place we stopped was an overlook near the entrance to the harbor. I include it here only because it is the last photo taken on our trip. Our final stop was at our hotel in downtown Auckland, the Stamford Hotel. This was by far the most elegant hotel we had stayed at on our entire trip. First class is the only way to describe it. Unfortunately, it was the hotel we spent the least amount of time in. We arrived late afternoon and had a going away dinner with the group at the hotel. We had our own room and the food and wine was excellent. 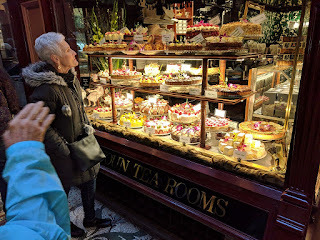 Unfortunately, Dianna had developed digestive problems from all the rich food by then, so she was not able to enjoy it as much as the rest of us. After saying our good byes to all our new found friends, we went to bed early because we had to leave the hotel the next morning at 4:30 to catch our flight home. Thus ended the tour part of our trip. It was indeed a trip of a lifetime, and we enjoyed it immensely, but there were some challenges at our age. We left on the 2nd of October and returned late on the 18th, so the total trip was 17 days. There were times we were exhausted from getting up early. Most days we began our travels around 7 AM which meant we got up at 5:30 or six, then had breakfast at the hotel. Some of those days were travel days so we also had to pack our bags. The travel itself was also exhausting. We took 14 different flights altogether, 10 of which required going through airport security, the bane of modern air travel. 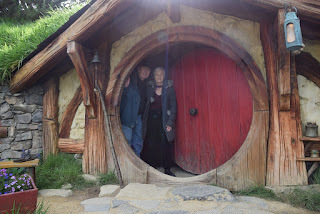 Fortunately, neither of us suffered from any jet lag, but the rich food, although delicious, was not kind to either of us. All in all we had a great time. 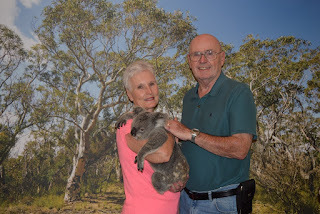 It was a great way to celebrate 50 years together. My apologies for the very lengthy blog post, but we did a lot, saw a lot, and experienced a lot. It was a great trip that we will remember for the rest of our lives. I have posted only a few of the over 400 photos we took, but hopefully enough to give you some idea of what we saw. What follows are some observations and thoughts that don't fit elsewhere in the post. In fact, much it may not interest anyone, but I wanted to document it somewhere. 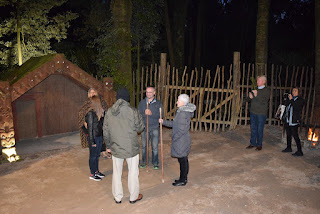 This was the first time we have taken a guided tour and it had its pluses and minuses. We saw a great deal in a short amount of time, and our guides were excellent. They were both very knowledgeable and provided us with a great deal of information. We also went places and had tours that were not available to the general public. 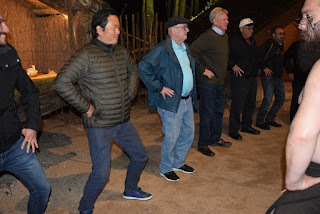 There was also a good deal of free time built into schedule so we were able to customize the tour to a certain extent, choosing what we wanted to do (or do nothing but rest) on those days. There were a few places we went that were not worth seeing, but for the most part the sites were interesting and worthwhile to visit. As I mentioned, all the provided meals were excellent. Wine was provided at every dinner, and mixed drinks were provided at some events. But we could only handle so many rich meals in a row. On three occasions when there was no group dinner provided, we walked to a nearby convenience or grocery store and just bought Ramen or Cup of Soups which we fixed in our room. By the way, they do not have little coffee makers in rooms there. Instead they have electric kettles so you can make hot water. Instant coffee, tea and instant hot chocolate are provided. More simple and easier than the coffee makers in the US hotels. I got some cash in both countries, but it was not really necessary. In Australia I got just $40 AU in cash from an exchange place at the Airport, paying a rather large transaction fee and getting a poor exchange rate. However we found that nearly everywhere we went accepted Google Pay from my phone. I had Google Pay attached to my Citi Visa card that charged no exchange or transaction fees, and had a very fair exchange rate. They also took credit cards everywhere, but I like the convenience and additional security of using Google Pay since I did not have to share my actual credit card number. I did use some of the cash in a couple places, just to use some of it, but it was not really necessary. I used the last of it at a food counter at the airport as we were leaving Australia for New Zealand. I paid what I had left in cash and put the rest on Google Pay. In New Zealand I got smarter. I still wanted to have some cash with me but this time I used my debit card at a local bank to take out $40 NZ. That way I again had no transaction fee and a good exchange rate. I used my USAA debit card so they even refunded the ATM fee that the bank in New Zealand charged. However, it was the same situation as in Australia in that I had to look for places to use up the cash. At least in these countries, there was no reason to exchange your money or carry more than a small amount of cash. 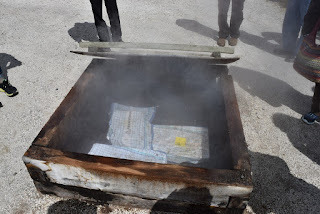 One interesting thing that happened on the trip was the way our bags were handled. Each of us, and most everyone on the tour, had one roller bag apiece. The tour company included all baggage handling in the cost of the tour. When we arrived at each hotel, we were told to just check in (basically just get your keys) and that the bags would be delivered to our room. While that sounded like a nice thing, at the first hotel in Cairns it worked OK. In Sydney it took 45 minutes for our bags to get delivered. After that, nearly everyone stayed at the bus and took their bags with them when we arrived at a new hotel. The tour guides tried to get us to let the bell hops handle it, but no one wanted to wait for their bags again. Also, on those days when we traveled, we were told to leave our bags outside at a certain time (usually an hour or more before we were scheduled to leave the hotel) and that they would be collected by the bell hops. While it worked, it also meant that we had to be packed way before we were ready to leave, and usually before we even went down for breakfast. Soon some of us were bringing our bags down with us a few minutes before departure. All the collected bags were sitting there waiting to be loaded on the bus, and we just added ours to the group. In addition to 14 flights and many hours on airplanes, we also spent countless hours on tour buses. Most were very comfortable and even had doors in the center as well as at the front. It made boarding and getting off quick and easy. A couple of them also had free WiFi, but it was slow and not of much use since we were off and on frequently. We certainly admired the drivers ability to navigate the narrow streets in the busy city centers. It took a great deal of skill. As I think of other tidbits, I may add them here, mostly as a way of documenting them for my own review. Sorry if this was not of interest to casual readers. Such a wonderful trip for you two. So glad you finally got to see it. I need to take Betty to Paris and then this trip seems like a good one next. 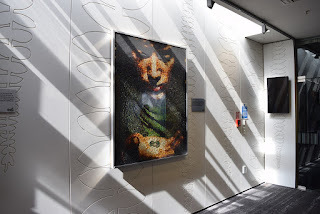 Thanks for the excellent documentation and photos! I surprised myself by reading straight through. It was well written and brought back lots of memories of our own trips. 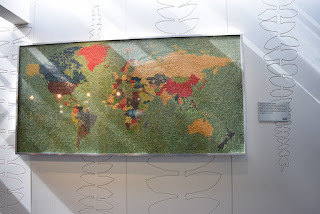 There was "overlap" in the places we visited and saw. You saw a few places that we missed, or that weren't there yet, and we saw a few that you missed. 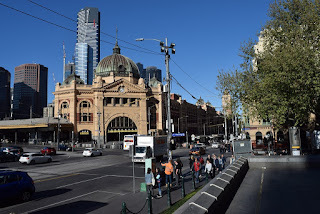 I think comparing Melbourne with San Francisco is pretty apt, but I don't think Melbourne is nearly as racially mixed. In that way, Sydney is more like San Francisco, though much more spread out. It looks like Richard won the "make the tourist look stupid" game in New Zealand. 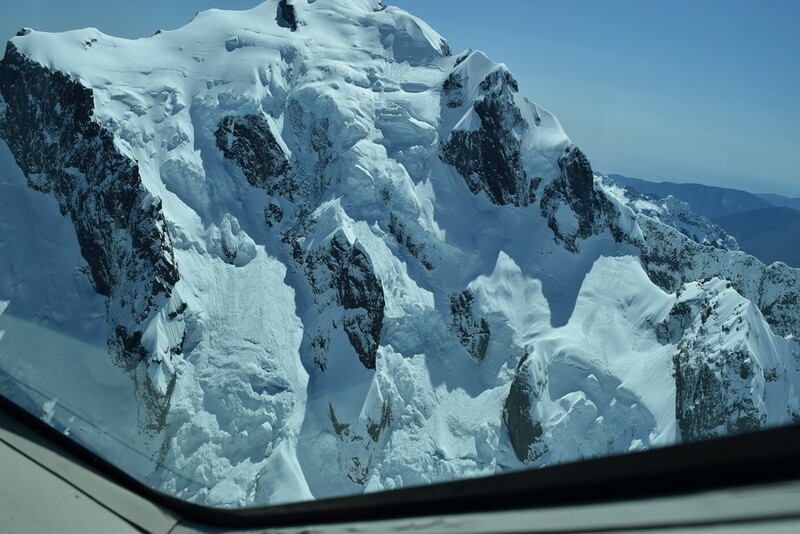 We thought the bus ride to Milford Sound was well worth it, but next time we may take the flight after reading this. There was obviously no Hobbiton when we visited 20 years ago. That would be interesting to see. 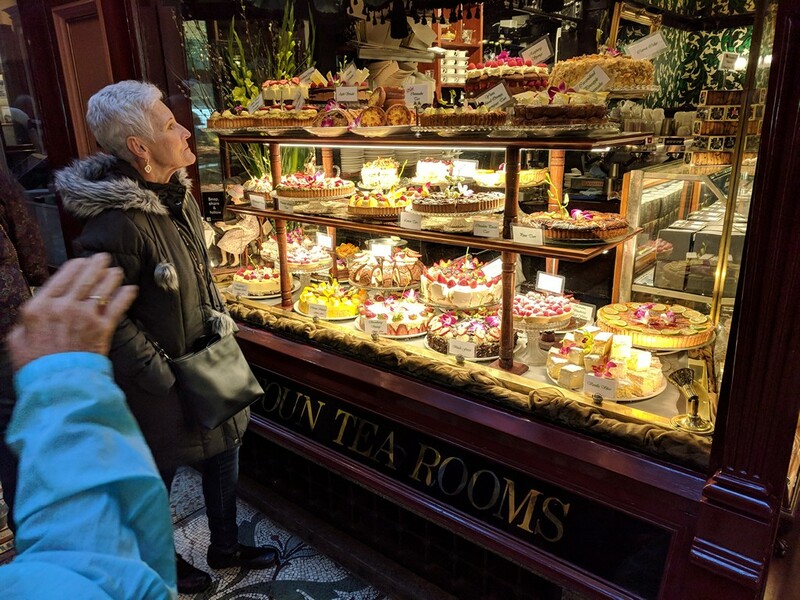 We've done lots of guided tours and lots of self travel and I agree with Richard that there are pluses and minuses with both. Gisele tends to like guided tours a little more than me, but we are both open to both types. Leaving your suitcase outside the door early in the morning (or the night before), and getting up and traveling early each day gets a little old after a while. 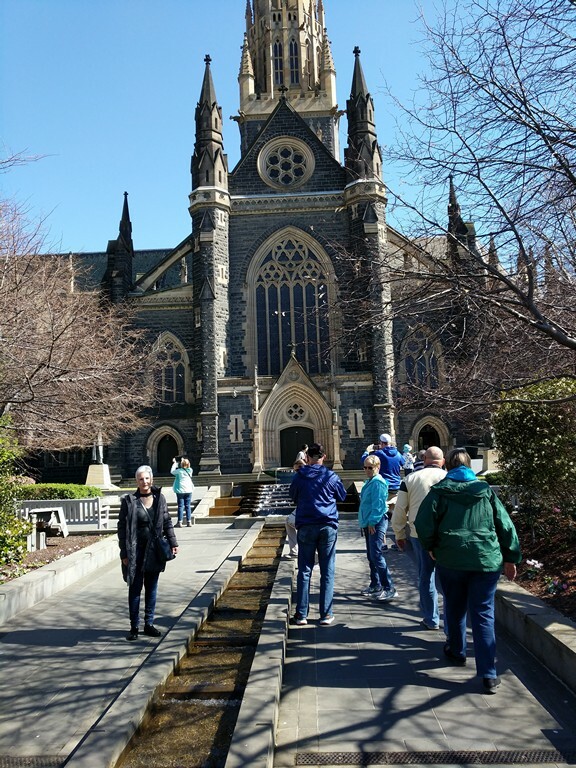 And we like the flexibility of traveling on your own, but you do miss some things that a tour guide knows how to cram into your itinerary. 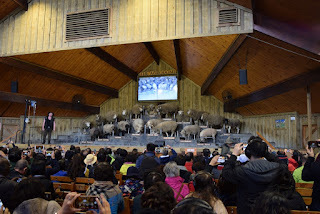 We have been thinking that we would like to go back to New Zealand. 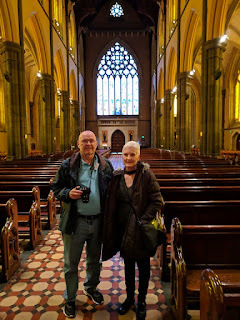 We've been to Australia 4 times, most recently a couple of years ago, but only twice to New Zealand and the last trip was over 20 years ago. This post may provide enough impetus to push us into making another visit. We'll see! I just got a chance to finish reading this post and it was great. Makes me want to go down under even more. I'm going to have to find a good travel companion though who will be willing to visit these locales and highlights you wrote about. 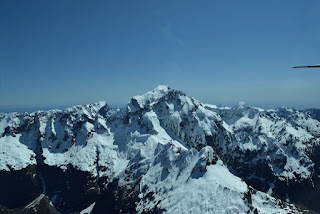 Especially the flight to Milford Sound. That was spectacular. I'm sure you can understand the appeal.